Under Armour Shadow 4.0 Running Cap. With this Under Armour Shadow 4.0 Running Cap, it doesn't heat up as fast under the sun thus keeping your head as cool as possible allowing you to focus. Under Armour Shadow 4.0 Running Cap - AW17 Product Features. Mens Under Armour Storm ADJ Cap in Green. Mens Under Armour Storm ADJ Cap in Green. - Pre-curved brim. - Panelled design. - Adjustable back strap. - Perforations to centre. Under Armour Shadow 4.0 Running Cap. With this Under Armour Shadow 4.0 Running Cap, it doesn't heat up as fast under the sun thus keeping your head as cool as possible allowing you to focus. Under Armour Shadow 4.0 Running Cap - SS19 Product Features. Under Armour have incorporated their signature ArmourVent technology into the construction of the cap to allow maximum breathability to keep you cool and dry. 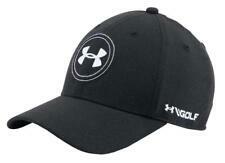 Under Armour Launch ArmourVent Running Cap. Cap is royal blue and white in color. This Los Angeles Dodgers Flex Fit Cap features Dodgers logo at front and Under Armour logo on closed back. One panel construction. Curved bill. Fabric: 100% Polyester. Stretch construction provides a comfortable fit Under Armour Blitzing 3.0 Running Cap The Under Armour Blitzing 3.0 Running Cap provides the wearer with ultimate comfort and structure. The cap contains HeatGear and Threadborne to ensure you remain cool, dry and comfortable. Mens Under Armour Storm Headline Cap in Black - Pre-curved brim. - Six panel design. - UA Storm technology repels water. - Perforations around centre. Structured build maintains shape with a slightly higher crown. Stretch construction provides a comfortable fit. Classic Fit. temperature consistent in any condition. from your skin, Keeping your dry and your body. If you are looking for a UA to get noticed - check out this Sharp Lid. Brand New Authentic Officially Licensed Under Armour Jordon Speith 2.0 Hat in Flexfit Size L/XL to give you that fitted look and feel. These are my LAST ONES! Thanks for looking and have a great day! Lisa. Undeniable Stretch Fit Cap. Protect yourself with the UA Undeniable Stretch Fit Cap. Under Armour. Color: Academy. Build maintains shape with a slightly higher crown. Stretch construction provides a comfortable fit. Hat with visor curve. HeatGear fabric lining Ribbon away sweat. Stay-dry technology gives you the comfort to keep going in this Under Armour Blitzing II hat, with a stretch design for a stay-put fit. Structured build and slightly higher crown maintain shape. Structured build maintains shape with a slightly higher crown. Stretch construction provides a comfortable fit. Polyester Imported. Material: 80% Polyester 20% Elastane. UA Classic Fit features a pre-curved visor & structured front panels that maintain shape with a low profile. UA Microthread fabric uses re-engineered fibers designed to give superior stretch & breathability. Color: Mossy Oak. Adjustable snap closure in the back. Unstructured fit conforms to your head for lower profile.